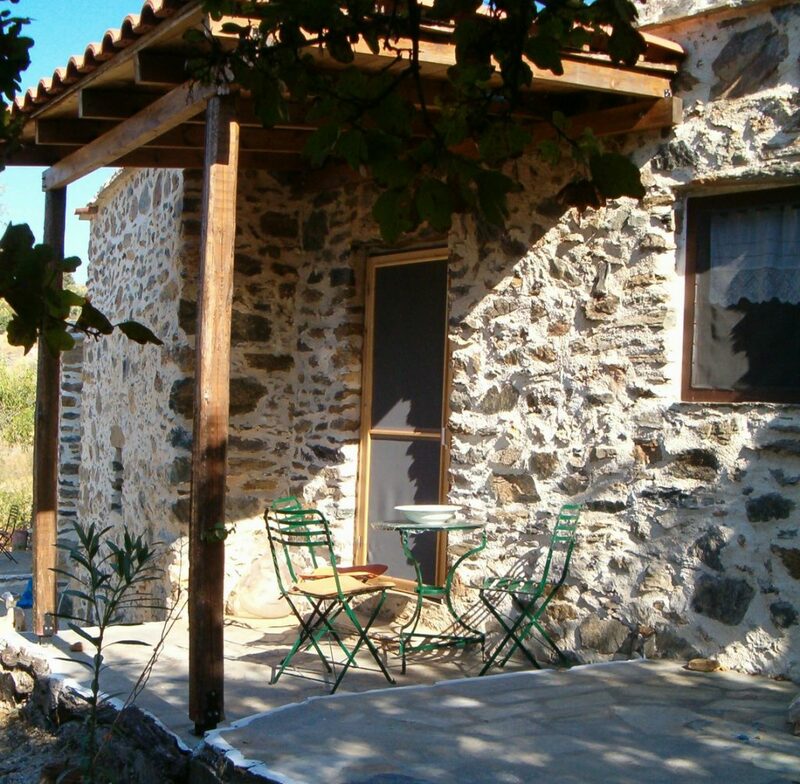 A stay in Lagadi tou Karava will make your holiday on Kythira even more special. 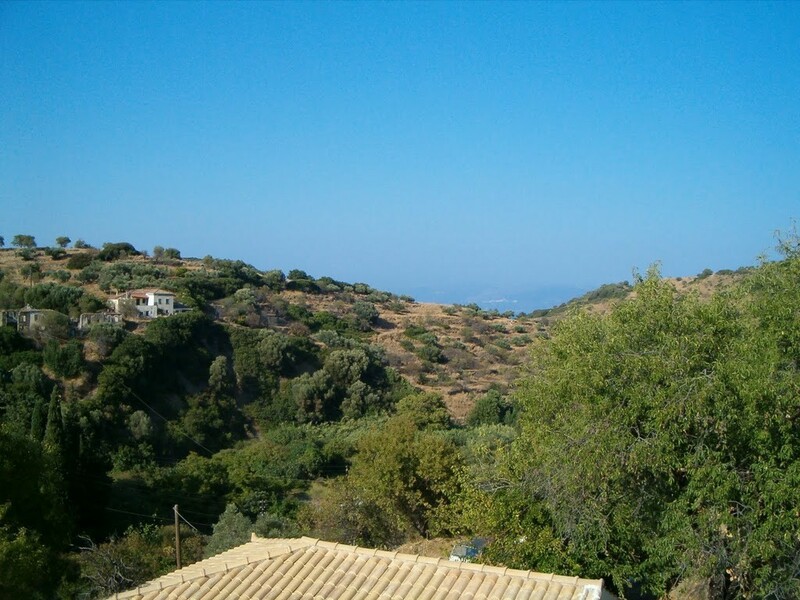 As the name in Greek suggests – Lagadi means valley –, the accommodation is located in the valley between Karavas and Plateia Ammos. Driving for the first time towards Lagadi tou Karava, you might wonder whether you will reach the destination or not… From Karavas, a partly unpaved and narrow road winds through the beautiful green valley. 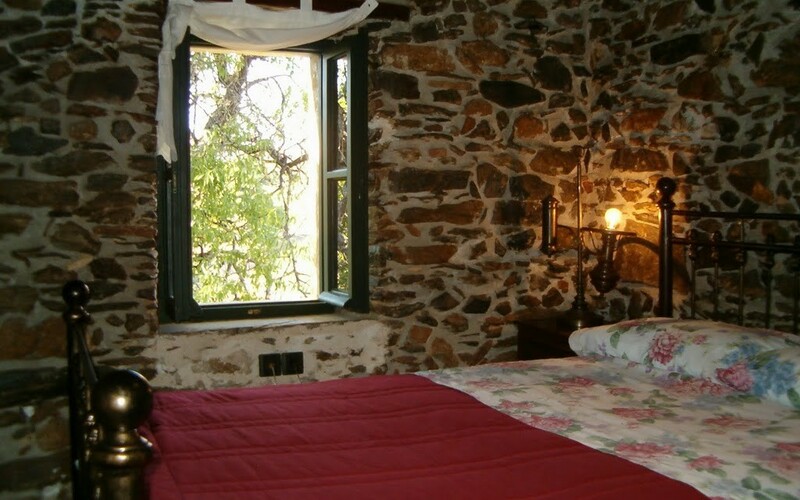 You will pass springs and many well maintained gardens until you reach the accommodation, hidden between trees. Without any doubt, staying in Lagadi tou Karava you are in the middle of nature, enjoying the quietness, the loneliness and the beauty of it. For sure, it is the perfect spot for walkers and nature lovers. Georgia and Kostas are the proud owners. Originally they came from the north of Greece and Athens. 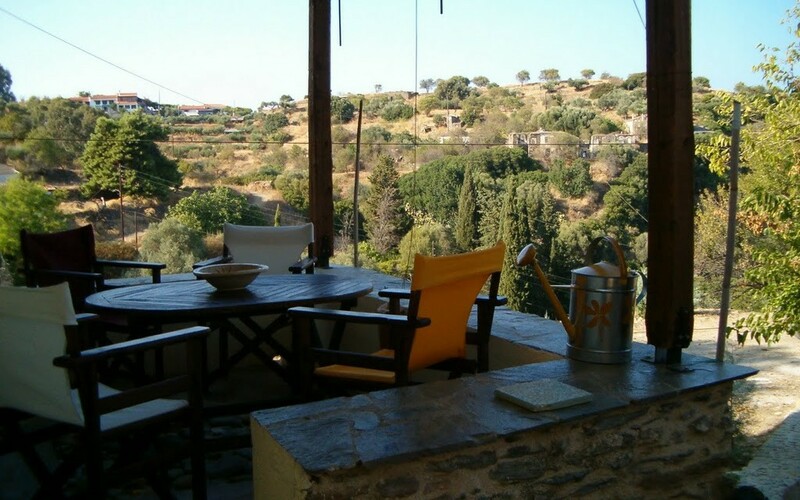 They visited Kythira for the first time with a tent in 1978, together with their three children. 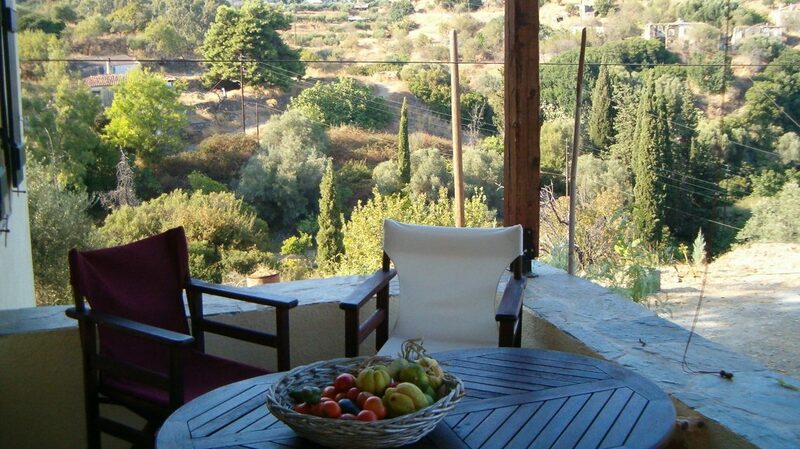 As they were all very impressed by the beauty of the surroundings of Karavas, since then they have spent their holidays every year on Kythira. In 1998 they bought a ruined farmhouse which they rebuilt into the beautiful Lagadi tou Karava. The accommodation consists of two freestanding buildings. In the main building are two apartments, Fossa on the ground floor and Sempreviva on the first floor. The third apartment, Lanos, is in the second building, slightly further uphill. Georgia and Kostas have an eye for detail and they decorated their apartments very tastefully, using natural materials and traditional furniture. Fossa and Sempreviva suit four people, Lanos can host three. All apartments are spacious and, upon request, extra beds can be easily provided. 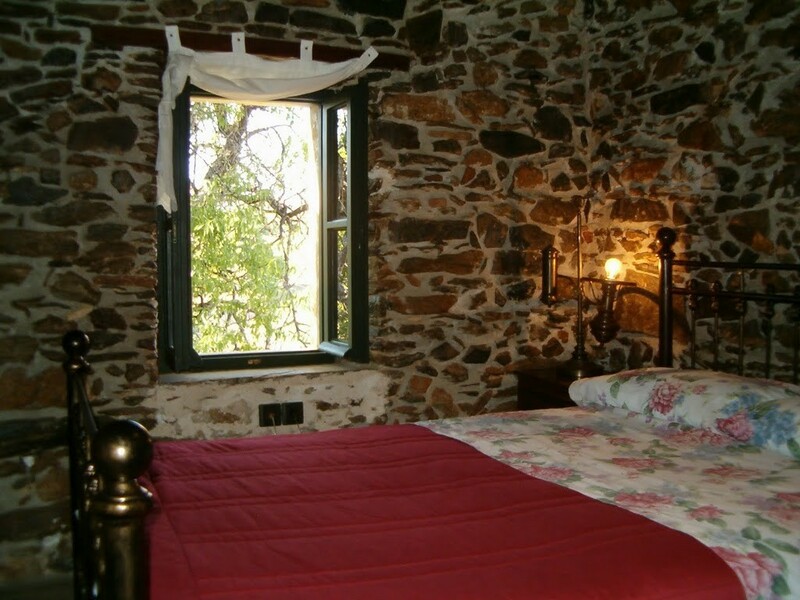 The Lanos apartment, named after the room where grapes used to be pressed, has a living and sleeping area in one room with a double bed, a wide single bed and a traditional fire place. From the living room you enter the kitchen and the partly covered private terrace. 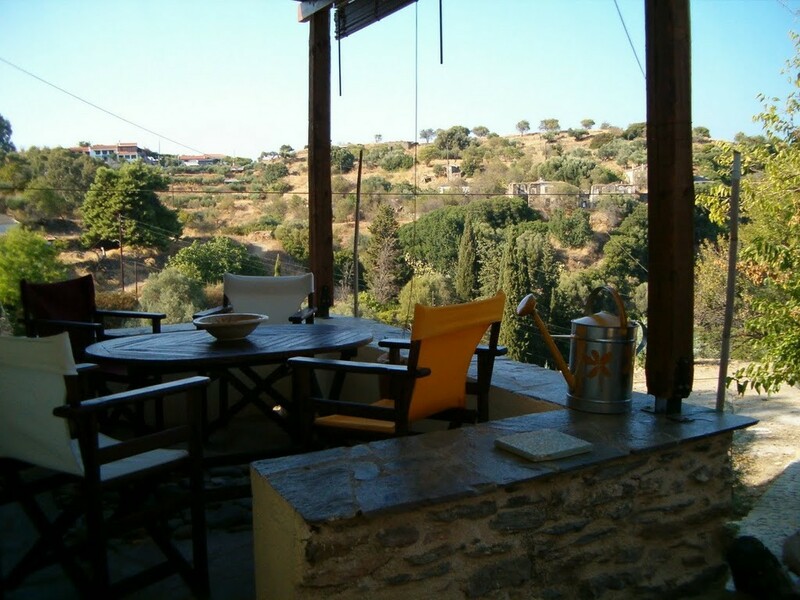 Besides a living and sleeping area with two single beds, the larger Sempreviva apartment, the name of the bright yellow flower which grows only on Kythira, also has a separate bedroom with a double bed. In the kitchen you will notice the traditional fire place. From the covered terrace you will enjoy stunning views to the valley. 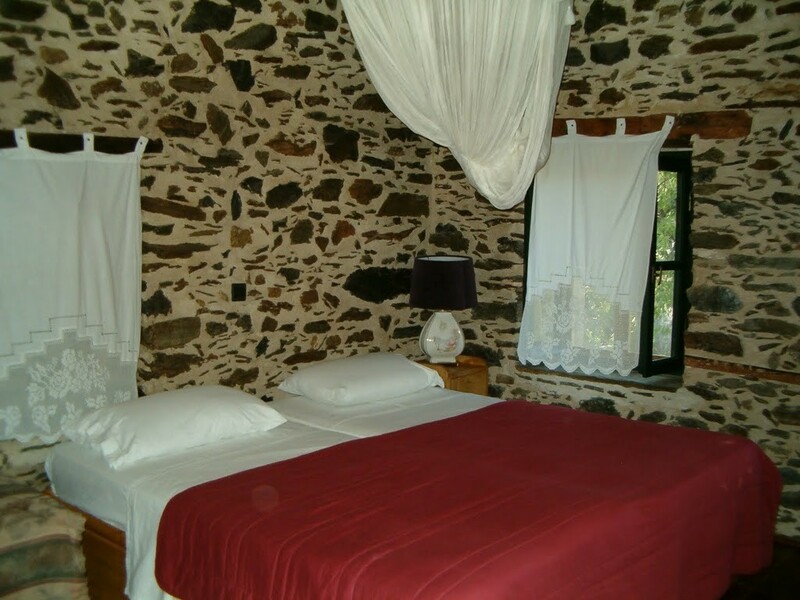 Fossa, the Kythirian name for the low archway of the entry, has a living and sleeping area with a double bed, and a separate bedroom with two single beds. 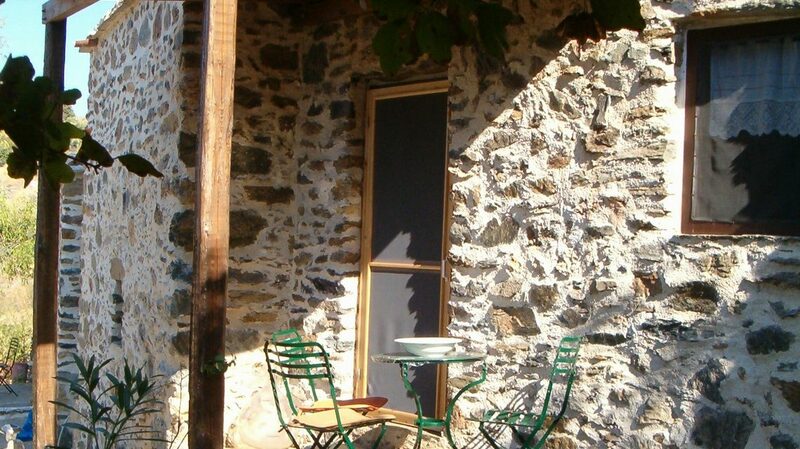 From the kitchen you enter the shady terrace, a cool spot to relax after a beautiful walk. Each apartment has its own bathroom with toilet, shower and wash stand. 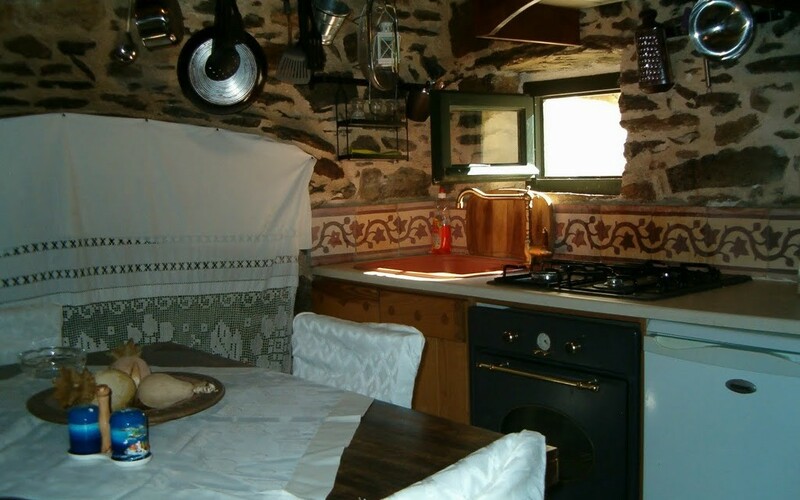 The kitchens are well equipped (electric boiling ring, coffee machine, electric kettle). 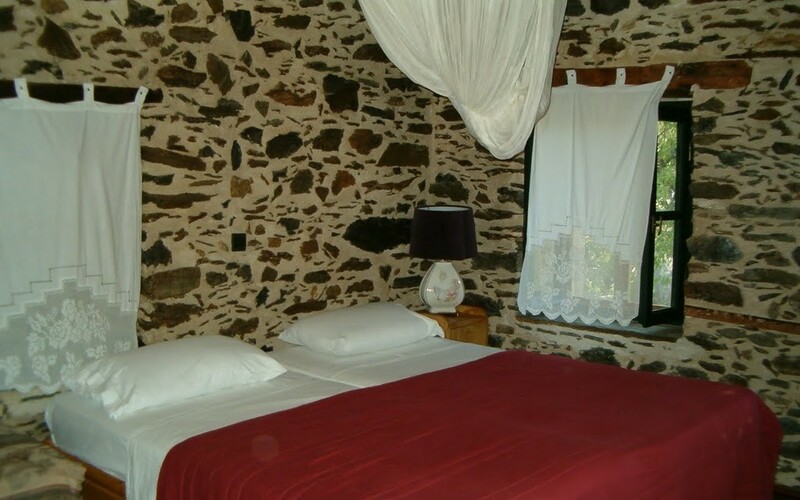 Additional facilities are the minibar, television, DVD player and mosquito screens. Wireless internet connection is available at the reception. Georgia and Kostas will welcome you with a tsipouro, Kythirian paksimadia and ladotiri. By tasting these local products – brandy, rusks and cheese – you will immediately feel at home. And if you don’t feel like cooking for yourself or going out for dinner, upon request, Georgia can cook the most delicious meals for you, using products from her biological garden, which is located around the accommodation. Lagadi tou Karava is open from June until September. 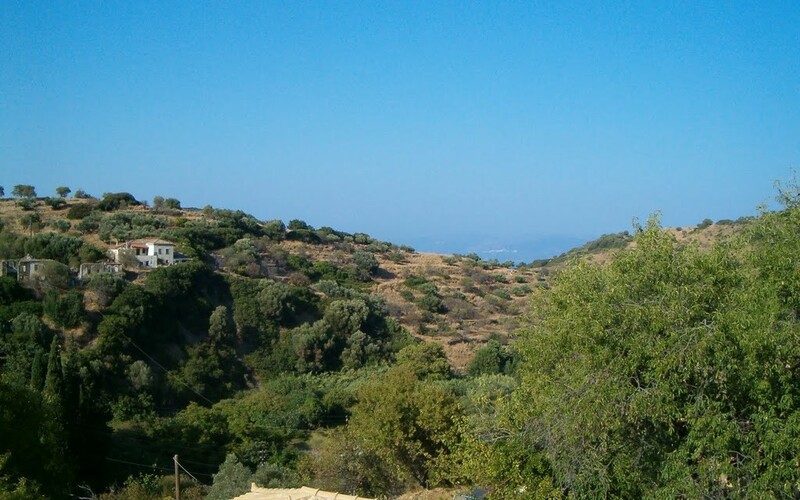 Karavas is a 20 mn walk from Lagadi tou Karava. 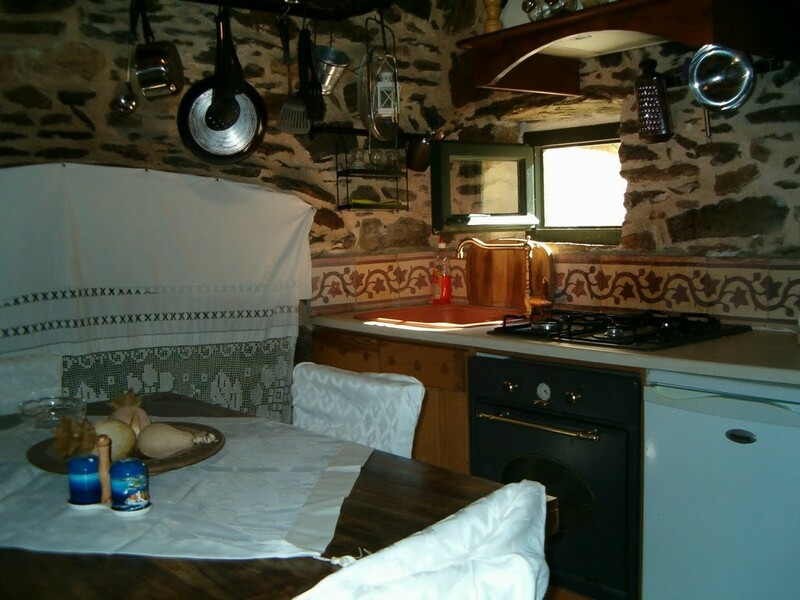 Here you will find a bakery, a taverna and a small grocery shop that is located in the old village “kafeneion”. Please be aware that the grocery shop is not very well stocked. 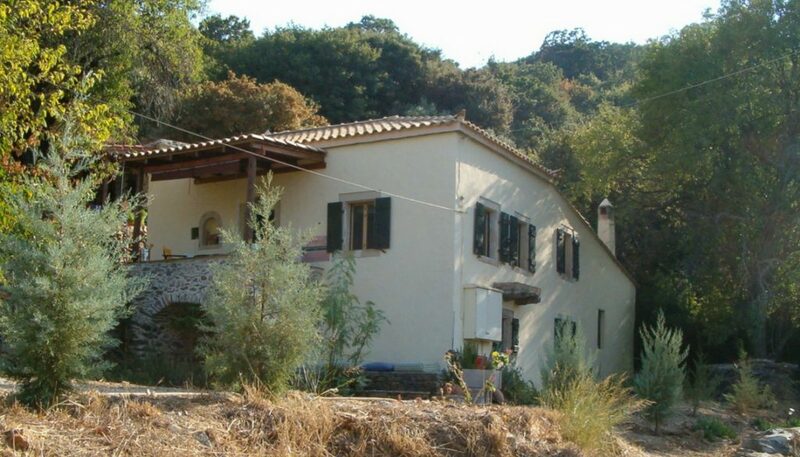 The nearest supermarket is located in Agia Pelagia, 7 kilometers away. Because of the remote location of Lagadi tou Karava, we strongly advise you to hire a car. 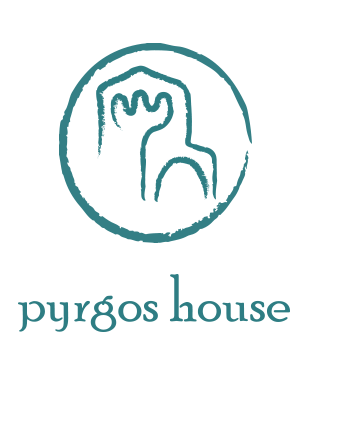 Pyrgos House co-operates with the car rental company Panayotis Rent a Car Motorent and offers you a discount on the daily rate. Please feel free to enquire about the conditions.